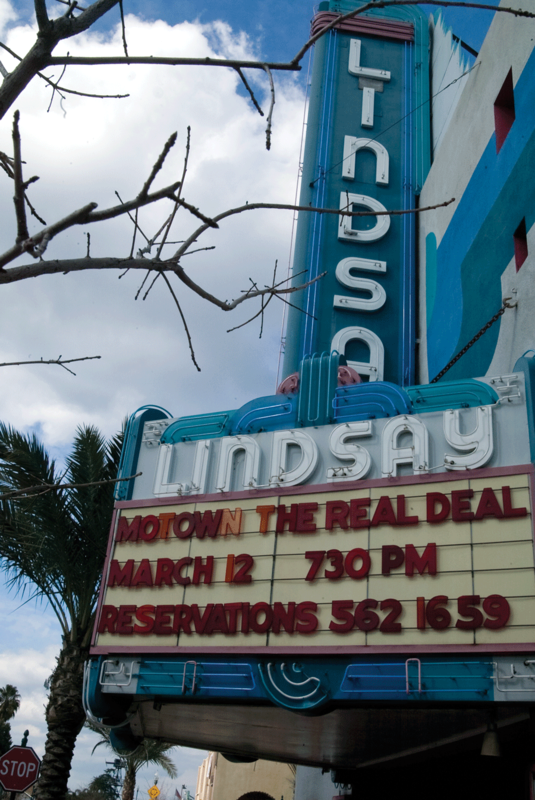 LINDSAY – Last year the Lindsay Community Theater tried to relight its marquee. That fell through. The company hired to renovate the marquee and upgrade the equipment to LED (light-emitting diode), ran off with the lights and the money. “They got $5,000 of our money and we got nothing out of it,” said Jim Kliegl, theater manager. The total cost was estimated at around $6,500, of which, the theater had already paid the $5,000. The owner of Bakersfield Neon said they were coming back, but never did. Now, the theater has hired a new company to work on the marquee, Kliegl said, while it’s still trying to recover the funds from the former company, which seems to be out of business. Bakersfield Neon has earned an “F” rating with the Better Business Bureau. It has at least three complaints filed against it, one of which was from Kliegl. Upon further investigation, theater representatives have found the company was licensed to sell LED lighting, but not to install it. The marquee, dating back to the 1930s, was not only suffering from age, but also from vandalism. While the outlay of funds for the upgrades is a bit pricy, the savings in the expense to utilize the marquee will be about 90% less. The new company hired to do the repair work, and upgrades, has estimated a cost of $8,600. As the original $5,000 already spent, the funds are coming out of the theater’s general funds. But, further repair work to the aging theater needs to be done, Kliegl said, including a new roof and an electrical panel that shorted out. Repairs are a never-ending process and a necessity, he added. The roof, it is estimated, will run around $50,000. That’s $50,000 the theater does not have to spend. In search of further funds for the work needed, Kliegl has started a GoFundMe page for the theater with an initial goal of $15,000. So far, $1,250 has been raised. The theater board is also hopeful it may be able to find a generous donor, who could offer a no-interest loan. To the residents of Lindsay, the marquee is more than simply the theater. It is a tradition, a mainstay, a beacon for the town. There are seven plays and six concerts planned for the Lindsay Community Theater 2018-19 season. Shakespeare in the Plaza, produced by the theater, will run August 16, 18, 23 and 25 at the Sweet Briar Plaza Outdoor Stage with Much Ado About Nothing at 8 p.m. Admission is free, although any donation is greatly appreciated. To help light up the marquee, the GoFundMe page is located at www.gofundme.com/lindsay-community-theater. Jim Kliegl may be reached at jrkliegl103@gmail.com.